Welcome to a fabled world that is full of life and free of cares. A magical place that invites you to discover all things imaginative and inspiring, pulse-pounding and breathtaking, unbelievable and unforgettable. From the moment you arrive, you’ll be immersed in a dazzling array of enchantments, luxuries and pleasures. You’ll be amazed by the spectacular events, epic concerts, and countless choices Atlantis offers to help you create the perfect vacation in paradise. A mythical ocean paradise that once was lost, and now is found. The Atlantis has numerous towers, each one unique in it’s own way. We suggest “The Cove Atlantis” luxury tower. On the apex of Cove and Paradise beaches, sits Cain at The Cove, an adults only ultra-pool with an outdoor gaming pavilion and 20 private cabanas. Offered exclusively to guests of The Cove Atlantis. If your traveling with family the Beach Tower is a great option with white sand beaches and dozen of swimming areas. 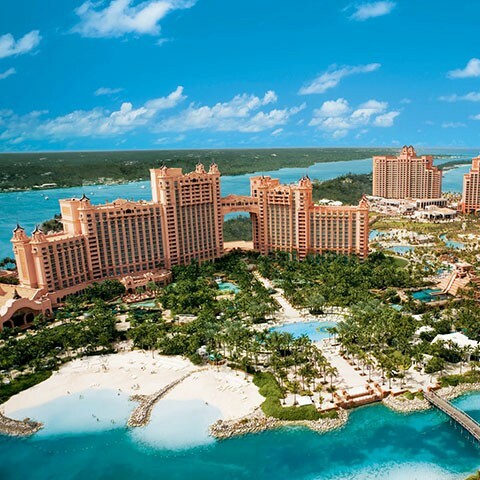 Linking the towers and spanning a 7-acre lagoon, the world-class Atlantis Casino is an innovation in casino design. Brilliant glass sculptures by artist Dale Chihuly infuse the casino with a vibrant, colorful energy. The Atlantis Casino is equipped with state-of-the-art player tracking systems, allowing guests to insert their room key into any slot machine or present it at any table to begin earning points toward promotional giveaways. There are over 75 gaming tables featuring baccarat, Caribbean stud poker, Let It Ride, craps, roulette and blackjack and 750 of the latest slot machines. Complimentary daily gaming lessons are available every day.